In our the world of designing and making, one of the high points on the annual calendar is Milan Design Week. 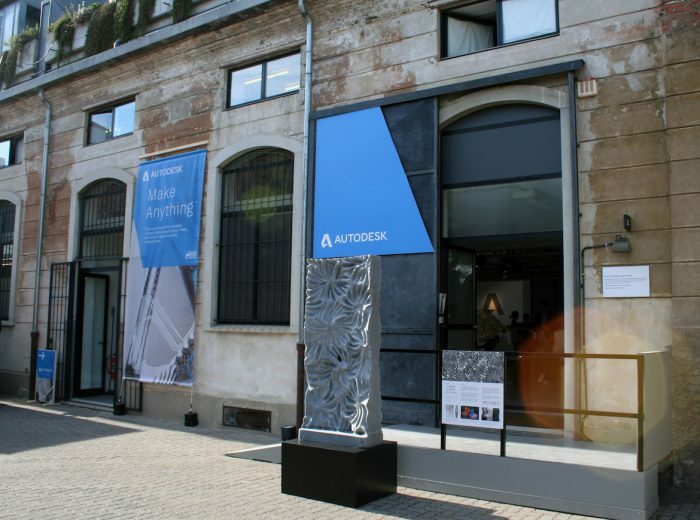 And every year, Autodesk sets up an exclusive gallery, showcasing the most innovative work created by some of the world’s leading designers. This year is no different for our space at Via Tortona 31. The exhibits show how our customers are exploring the new frontiers of the future of making, including generative design, advanced manufacturing methods and more. Generative design is a process where the infinite computing power of cloud allows the rapid creation and exploration of infinite design options, examining hundreds of potential solutions to a design problem, including those that most human beings could never conceive of on their own. It’s an example of human-computer collaboration at its finest. Two more generatively designed chairs—one fabricated with wood and a CNC router, the second designed and 3D printed in a single operation by robot-controlled metal additive manufacturing. The result? Two stronger, more comfortable chairs. Like the Starck A.I. chair, the Elbo and Nee chairs were created using Autodesk’s generative design software. It allowed the design team to generate hundreds of design options to choose from, and select the best solution based on data performance, producibility, and aesthetics. A multi-year research project in which NASA’s Jet Propulsion Laboratory and Autodesk will explore new approaches to design and production processes for lunar landers in order to reduce weight and carry more scientific instruments, accomplished with a customized application of Autodesk’s generative design technology. With its torus shape and stainless-steel façade decorated with glazed Arabic calligraphy, the Museum of the Future is everything its name embodies: groundbreaking and modernistic. The vision and focus on innovation also extend to the museum’s design and construction. Using Building Information Modeling (BIM) and a fully digital workflow, the project team was able to turn this vision for the future into a reality today. In creating a sculpture inspired by the reflection of objects in water, the artist Jon Isherwood, used Autodesk design software and advanced manufacturing methods to achieve shapes and forms that weren’t previously possible with Analog tools. Jon is the founder of Digital Stone Project, a nonprofit organization that connects artists with digital-design engineers and robotic stonework fabricators, pushing the boundaries of automated stone-carving systems. 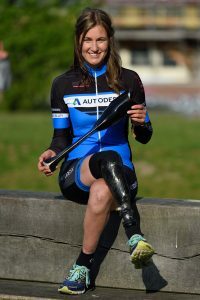 Using cloud-based design software, Autodesk and Paralympian cyclist Denise Schindler’s team were able to model, test, and iterate on different prosthesis designs before 3D printing the final polycarbonate version. The result: a lighter, more aerodynamic prothesis with more power output, produced in less time and cheaper than the traditional method. Visitors will have the opportunity to explore the latest technological trends that are changing the way we imagine, design and create the ‘things’ and the environment that surround us. They will also get concrete insights to address such radical changes thanks to incredible technologies that bring innovation and creativity. The exhibit is open every day from April 8-14 between 10am and 6pm- in Via Tortona 31. Come and visit if you’re in Milan!